Admiral John Briggs Hayes was born on 30 August 1924 in Jamestown, New York. He entered the US Coast Guard Academy as a cadet from Bradford, Pennsylvania, on 14 July 1943. Though listed as a member of the Class of 1947, Hayes actually graduated and received his commission on 5 June 1946. His first command was of the LORAN Transmitting Station in Matsumae, Japan. His first command afloat was that of USCGC Ariadne in November 1952. He also commanded the cutters Sagebrush and Vigilant along with the Coast Guard Base at Key West. In August 1959 he entered the US Naval War College at Newport, Rhode Island, and afterward was stationed in Washington, DC. In June 1964 he earned a Master of Arts degree in International Affairs from George Washington University. In March 1966 he became Commander, Naval Task Group 115.4 and Commander, Division II, Coast Guard Squadron One, Republic of Vietnam. 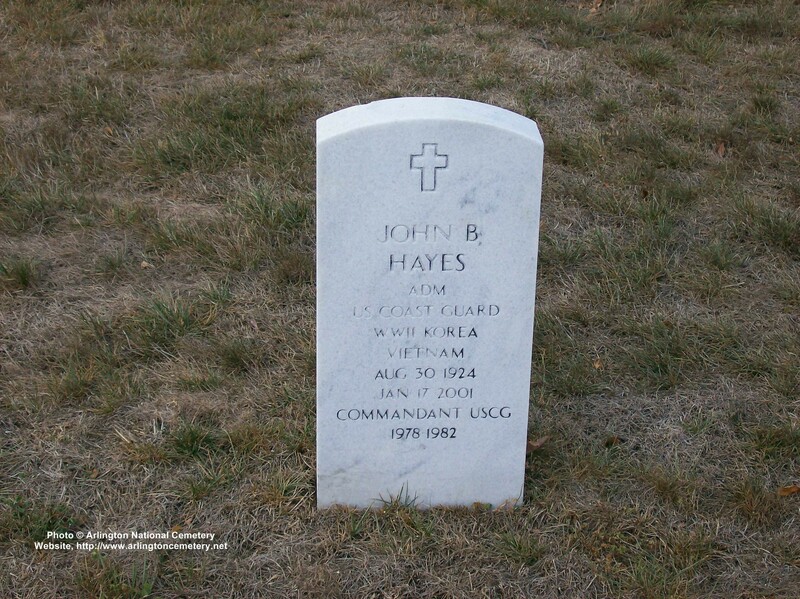 Admiral Hayes died on 17 January 2001, and was buried in Arlington National Cemetery with full military honors. WASHINGTON – Admiral John B. (Jack) Hayes, 76, Commandant of the U.S. Coast Guard from 1978 to 1982, died on January 17 in Tavernier, Fla., and will be interred at Arlington National Cemetery in Virginia on January 31 at 2 p.m. He is best remembered as a sailor and a champion of the Coast Guard as well as a beloved husband, father and friend. "Admiral Hayes was one of our most dynamic Commandants, an icon in the legacy of the Coast Guard. He was a personal mentor and role model to literally thousands of Coast Guard Officers and crew, including myself. He is truly loved by this organization and will be greatly missed," said Admiral James M. Loy, Commandant of the U.S. Coast Guard. Admiral Hayes was born in Jamestown, N.Y., August 30, 1924. He entered the Coast Guard Academy July 14, 1943, and graduated June 5, 1946, with a commission as Ensign. He spent most of his Coast Guard career in command positions. These included shore commands in Japan, Florida, Vietnam, and Alaska as well as sea commands of three Coast Guard cutters. Admiral Hayes returned to the Coast Guard Academy as Commandant of Cadets before his promotion to Rear Admiral in 1973. As Commandant, Admiral Hayes ordered a comprehensive Roles and Missions study that helped to shape the present-day Coast Guard. He led Coast Guard responses to several significant events including the Prinsendam rescue off the Alaskan coast, the Florida Air Flight 90 crash in Washington D.C., and the Mariel Boatlift which, at the time, was the single largest search and rescue operation in Coast Guard history. He also saw the Coast Guard through difficult budget battles and fended off proposed reorganizations he felt would undermine the flexibility and effectiveness of the Service. Admiral Hayes received numerous awards over the course of his distinguished career. Among those were the Coast Guard Distinguished Service Medal with one gold star, the Legion of Merit with one gold star, the Meritorious Service Medal and the Coast Guard Commendation Medal. His profound impact on many individuals’ lives was mirrored in his other interests and passions. An Eagle Scout, he continued his affiliation with the Boy Scouts as a troop leader and a member of the National Council. Both Bigelow Laboratory, a marine sciences laboratory in Boothbay Harbor, Maine, and the Armed Services YMCA benefited in many ways from his expertise and skills in long-range planning during his tenure as a member and Chairperson of their Boards of Trustees. His passions for scuba diving, fishing and hiking took him all over the world with family and friends. Admiral Hayes was an active member of St. Columba’s Episcopal Church in Boothbay, Maine. He served as Senior Warden for four years and was a driving force in guiding the mission’s efforts in planning for a church building. Jack Hayes was killed after being accidentally struck by a vehicle during a hike along the Florida Keys. He is survived by his wife, Elizabeth, of Boothbay Harbor, Maine; four children, Christie Hayes, John Hayes, William Hayes, and Virginia Hayes; and seven grandchildren. The Hayes family requests donations in lieu of flowers be sent to one of the following: St. Columba’s Episcopal Church Building Fund (P.O. Box 297, Boothbay, ME, 04537); Boy Scouts of America (BSA, National Office, 1325 West Walnut Hill Lane, P.O. Box 152079, Irving, TX 75015-2079); or Bigelow Laboratory (W. Boothbay Harbor, ME, 04575). Further information about the memorial service at Arlington Cemetery can be found at http://www.uscg.mil/news/Headquarters/WashingtonDC.htm. Retired Admiral John Briggs "Jack" Hayes, 76, of West Boothbay Harbor, who was killed after being hit by a motor vehicle in Tavernier, Florida, on Wednesday morning, January 17, will be buried at Arlington National Cemetery in Virginia on Wednesday, January 31 at 2 p.m. A memorial service in the Boothbay region will be held at a later date, according to his family and the U.S. Coast Guard. operated by Paula Jean Maxham, 41, of Key Largo, hit Hayes. He was pronounced dead a short time later at nearby Mariners Hospital. The accident is still being investigated and no charges had been filed against Maxham as of press time. Maxham claimed that she had been blinded by the early morning sun when the accident occurred. An avid hiker, Hayes had walked the 112-mile length of the Keys before and had planned to meet up with his wife, Elizabeth, in Key West where they frequently vacationed and where Hayes served as Coast Guard group commander during a storied career that spanned nearly four decades. "Admiral Hayes was one of our most dynamic commandants, an icon in the legacy of the Coast Guard," said Admiral James M. Loy, present Commandant of the U.S. Coast Guard. "His work puts him on par with previous commandants Bertholf and Waesche. He was a personal mentor and role model to literally thousands of Coast Guard officers, including myself. He is truly loved by this organization and will be greatly missed." 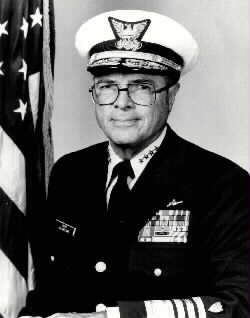 Admiral Hayes spent most of his Coast Guard career (1946 to 1982) in command positions. During the Vietnam War, he commanded Naval Task Group 115.4 and Coast Guard Squadron One in the Republic of Vietnam. He also commanded the Long-Range Aid to Navigation station in Matsumae, Japan, the Coast Guard Group Office in Key West, the 17th Coast Guard District in Juneau, Alaska, and the cutters Ariadne, Sagebrush and Vigilant. Admiral Hayes returned to the Coast Guard Academy as Commandant of the Cadet Corps before his promotion to Rear Admiral on August 1, 1973. In the media advisory issued after his death, the Coast Guard wrote: "Admiral Hayes is best remembered as a sailor and a champion of the Coast Guard. As Commandant, he ordered a comprehensive Roles and Missions study that helped to shape the present-day Coast Guard. As a result, the Service saw an extraordinary and unprecedented increase in marijuana and cocaine interdicted on the high seas....Admiral Hayes led Coast Guard responses to several significant news events, including the Prinsendam rescue off the Alaskan coast, the Florida Air Flight 90 crash in Washington, D.C., and the 1980 Mariel boatlift, when about 125,000 Cubans fled their homeland for Florida across the Florida Straights. Hundreds had to be rescued during the crossing which, at the time, was the largest search-and-rescue operation in Coast Guard history." On Thursday, flags flew at half-staff as a contingent of high-ranking officers, including Admiral Loy, arrived in Key West to pay respects to Hayes' wife and four children. Others Remember The Admiral Late last week, several people who worked with and knew Admiral Hayes were willing to share their thoughts about him. "He was a really nice person," said Neal Verge, Chief of Coast Guard Station, West Boothbay Harbor from 1981 to 1985. "He was well thought of in the Coast Guard and in this community. He was a good organizer and a people's man. When I took over the station here, he was still Commandant and lived in the harbor. He would drop over to the station and say hello. When I came to the YMCA, he joined our Camp Committee and was chairman. We worked closely together for the six years he was on the board. "This is a shock to everyone in the community. He was in here [the YMCA] a few days before leaving for Florida, walking the track and preparing for the walk in Florida. It's real sad. None of us know when something like this is going to happen." NFL Hall of Famer Otto Graham, who coached football and was athletic director at the Coast Guard Academy when Hayes was Commandant of the Cadet Corps there, said last Thursday, "He was a great guy. An excellent Commandant and cadet. He was honest and you knew where you stood with him. He was a hard worker. A top notch officer. "What a shame. Admiral Hayes was a loyal friend and I'll miss him. There hasn't been a finer officer in the Coast Guard. We're very saddened." Chief Kenneth Gibson, who was reassigned last summer to Fire Island in New York after being in charge at the West Boothbay Harbor station for three years, said Friday that Hayes "was an intricate part of why I came to Boothbay Harbor. It was great having him around. He had outstanding insight and had his fingers on the pulse of the Coast Guard. "Michele [Gibson's wife] and I were very saddened when we heard about his death. We thought the world of him. He and his wife, Bogie, would invite us into their home for a meal and conversation. He helped introduce us into the community and he made my job there easier. "He was an advocate for the Coast Guard, the Maine way of life, the life of the boater, the life of the fishermen. He will be missed in a lot of ways." Charles Yentsch, former director of Bigelow Laboratories for Ocean Sciences in West Boothbay Harbor where Hayes served on the board of trustees and as chairman, said Hayes "was greatly admired in the Coast Guard. He was considered a hero because he reversed a decision that would have privatized the Coast Guard. "He enjoyed walking, walking the Appalachians and all over Alaska. He enjoyed seeing his old friends in Key West. It was a good homecoming for him. This was such an unfortunate accident." Fran Scannell of Bigelow said Hayes "made big changes at Bigelow. He was responsible for building the modern board of trustees and helping to get it pointed in a direction to facilitate both education and research. He was very responsible for the development of the education phase of the lab, particularly the affiliation with the University of New England. "He was a very energetic, very likable guy. He and his wife were both good friends." Hayes served as chairman of Bigelow Lab's board of trustees and UNE's research affiliate from 1994 to 1996. In 2000, he was elected a trustee emeritus. The University of New England presented Hayes with an honorary Doctor of Laws degree in 1998.